The defendant said it was self-defense. The prosecution called it murder. 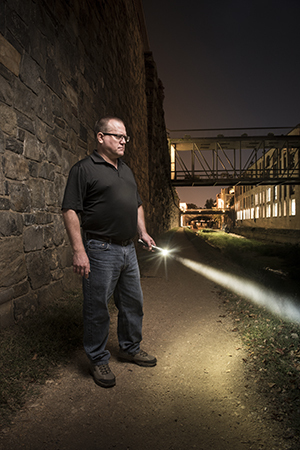 And former homicide detective-turned-private investigator (PI) Todd Troutner ’89 got the phone call, asking him to figure out what really happened. It was May 2012, and the case was Troutner’s first murder investigation as a PI. He’d worked dozens of violent crimes as a cop in Prince William County, Va., so he was thrilled to be back in the game. Troutner got in his car, drove to the Montgomery County Correctional Facility and began what turned into a seven-month quest to determine if the defendant, a 51-year-old Army veteran and security guard, had murdered his 23-year-old son. In his five years as a private investigator, admits Troutner, “It’s my favorite case, but it was a horrible situation.” Hired by the defense to see if the man’s claim of self-defense was true, he started with a jailhouse interview of the father and then watched the initial videotaped interview by the police. Finally, he went to the crime scene — an opportunity not every jurisdiction grants to private investigators. In this case, it was critical that Troutner examine the apartment where the shooting took place. He walked around and reinvestigated as if he were both evidence technician and cop, taking photos and measurements. “As I’m going through, I already knew the story so I had to make sure it made sense,” he says. He spotted a phone that was ripped out of the wall, for example, that matched the report. The prosecution’s theory was that the son was standing by a door at one end of a hallway when Dad deliberately took aim and shot him. Blood by that particular door and nearby carpet and tile supported that theory. But Troutner noticed blood farther down the hall, closer to where dad was standing when he pulled the trigger, which wasn’t mentioned in the blood pattern analyst’s report. That blood supported the defense’s claim that the son was shot when he charged at his father after threatening to kill him, a theory that police and prosecutors had dismissed. In fact, said defense attorney Steve Kupferberg, the father had been beaten and choked and grabbed his gun “as a last resort.” In the end, the verdict was not guilty. People often think of the private investigator as the guy who follows cheating spouses; and there’s a segment of the industry that’s very good at that and works in teams, with cameras, recording devices, and other equipment. Troutner, however, operates alone and refers cases like that to other investigators. His main area is criminal defense work, from homicide and kidnappings to shootings and assaults, and civil cases, such as car crashes and work-site accidents. Troutner likes to say he reinvestigates cases, searching for witnesses or evidence that might have been missed, video footage that wasn’t looked at, and statements in police and other reports that, in his experience as a former homicide investigator, don’t add up. The investigative process usually starts with a phone call from an attorney. Troutner gathers all the discovery the defense has — transcripts, photos, reports, recordings, affidavits — and comes up with his own plan for investigating the case. He often creates a to-do list for attorneys: Issue subpoenas for particular documents, send out a preservation letter to a store to keep a security video, get cell phone records, interview particular people. To Troutner, a private investigator is an essential part of an effective defense, yet “it’s a minute percentage of defendants that get one, so there are people going to trial without the best defense.” Many clients can’t afford a PI, or the court won’t appoint one, even if it’s an option. In some jurisdictions, he says, the prosecution isn’t required to hand the case file over to the defense — yet another critical reason for a good PI. Sometimes, however, Troutner finds that witnesses aren’t wavering, or they corroborate official reports. In that case, the attorney may go back to his client with the findings and say, “We can take this to trial but you’re going to lose.” At other times, Troutner’s work has persuaded prosecutors to drop charges. From April 1999 to April 2011, Troutner was a member of the Prince William County Police Department. “I loved it,” he says. Troutner spent six years in patrol, then went into major crimes (property and white-collar crimes) for six months. After that he was assigned to the Violent Crimes Unit (VCU); and for four years he worked on robberies, rapes, murders, and other death investigations. It was time to move on. He took a few months to think and decided he most liked the investigative aspects of being with the police. 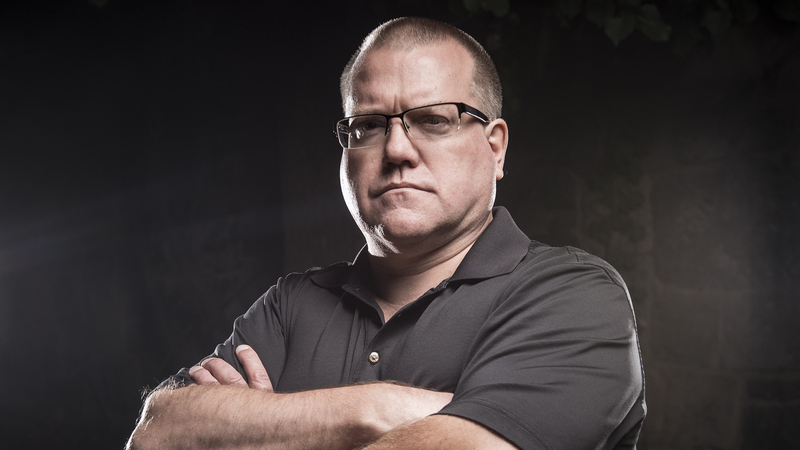 He put the word out and was hired by several law firms that had been impressed with his work as a cop; as time went on, Troutner’s PI business, Broadside Investigative Group, blossomed. Today, out of his Fairfax office, a white board charts the one to two dozen cases at a time that he works on. When phone calls come in, Troutner glances at the board to remind himself which case the call is connected to and what information he needs. In his mild Virginia accent, he’ll explain that he’s a former homicide detective, now a private investigator, looking into a case.